Johannes Vermeer (1632-1675) was born in Delft and baptized on October 31, 1632. Where exactly in Delft was he born - we would like to know that. According to my recent attempt at research he must have been born at Voldersgracht number 26 - or at least one could say that he lived there with his parents at least in 1635 and up until 1641 (Montias Appendix B, document 145, 17 October 1635). There is however a nagging questionmark which has come up since. According to the municipal information panel outside on Voldersgracht canal, he was born on the premises of Voldersgracht 25. Why 25 and not 26? Vermeer's father Reynier Jansz indeed rented a house on Voldersgracht [Fuller's Canal] and there he started an inn, named "The Flying Fox". We know of the second rental contract on Voldersgracht dating from 1637. Reynier's landlord was leather dealer and shoemaker Pieter Corstiaens Hopprus, economically succesful but almost illiterate. When entering that name in the new database of house owners in the Delft Archives it yields the house number 26, this in contrast to most former research by others. Also in contrast to Montias who stated that he lived "two houses east of the Old Mens Home", logically making it number 23. "A small scale research at the location where Johannes Vermeer was born in 1632 may illustrate this point. From a 1637 document it is known that his parents rented a house back in those days from Pieter Corstiaens'son Hopprus at Voldersgracht. Indeed the 1620-1632 "kohier van verponding" tax register does show a Pieter Corstiaens'son as an owner, of the third house east of the St Luke guild house [= Old Mens House]. This seems to correspond readily with present day Voldersgracht number 25. However, when we search within that address in the databank, this Pieter does not come up at all. We do however find him in the archival sources for the present day houses at Voldersgracht 26 and 27. Obviously in the years 1620-1640 a number of changes have been going on just in the row of houses at Voldersgracht 23-27 concerning lot ownership and rebuilding. Plausibly some buildings have been joined and then split in other lots - or the other way around. Only extremely detailed research in the building history, the ownership of houses and the names of persons living in those houses might yield Vermeer's exact birth house location. Thus enough riddles are left over to provide whole generations of researchers a pleasant puzzle." Willem Annema's detailed research, containing the list of documents and the spatial lay-out in consecutive maps he drew up of of building sites, is now in posession of Verhoeven, the Head of the Archives. Because of my inquiries, The Delft newspaper published an interview with Annema on June 19, 2004. In it Annema released the information that according to his research Vermeer lived at the site of Voldersgracht 25 - 26 in the years 1635-1641 and that there is a good chance he was also born there at the same address in 1632. Vermeer's father Reynier Jansz [the latter is the patronymic 'son of Jan'] originally was a caffawerker [Caffa worker]. Caffa worker is the name given to a weaver of a damasked fabric containing silk and either wool or cotton. As stated, Reynier rented a house at Voldersgracht in which he started an inn in order to make a better living for his family - and later on he ran a combination of an inn and a trade in fine art paintings. The inn was named the Flying fox, de Vliegende Vos. This name referred to his own first name Reynier and his last name Vos, both alluding to the old story about Reynard the Fox. Patronimics [as in Jan's son] being the standard in society and last names being a fairly new thing, he used the name Vos / Vosch in 1628 and later on in documents - however being an upmarket painting dealer and therefore a Guild member, he started to call himself Reynier Jansz Vermeer (1640). In his capacity as dealer in paintings Reynier among others traded in landscapes by Groenewegen. Some of the sketches in the Bramer album (made between 1642-1654 by Bramer) were copied from paintings in his trade collection. 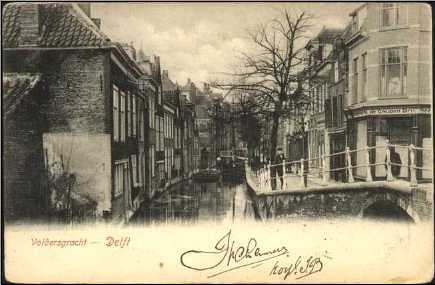 Under the family name of Vos he had twice rented a house at Voldersgracht for use as an inn, and (with Montias) we accept that this was twice the same house. The first contract is lost but we do know the second contract, dated 1637. In another earlier document Vos is mentioned as living at Voldersgracht in 1635 as well, as caffa worker and innkeeper of The Flying Fox. More research will be needed to find the exact setup of the present day house numbers 25 and 26. We know that the boy Johannes Vermeer indeed lived there (at least between 1635 and up until 1641). He may have been born there as well. An artist neighbor to the west (towards the Old Mens House) was Cornelis Damen Rietwijck. For Vermeer's consecutive homes see Johannes Vermeer, Vermeer 1, Vermeer 2, Vermeer 3, Vermeer 4, Vermeer 5]. One year prior to Vermeers birth Reynier Claesz / Vos / Vermeer had a house guest by the name of Barent, brother of the flower painter Jan Baptist van Fornenburg. Reynier had delivered a vat of brandy on board of an East India ship for the benefit of Barent. This 1631 document was witnessed by the fower painter Balthasar van der Ast . J.B. Fornenburg obviouysly had good contacts in Delft. He copied flowers from a flower painting dating 1616 by J.W. Vosmaer. Notes. Research by Montias (1989/1993) appendix B document 145. The site on which the Guild of St. Luke building was standing (see the 1923 aerial photograph) has subsequently been turned into a new elementary school. This school is now to be demolished. A few architectural parts from the original St. Luke building may still be seen in the architectural fragments collection in the back garden of the Rijksmuseum, Amsterdam. Caffa is a damasked cloth made from silk mixed with cotton or wool. In a document from 1645 Reynier is called 'master' in this caffa cloth trade. For Bramer see Plomp 1986, p. 81-82.